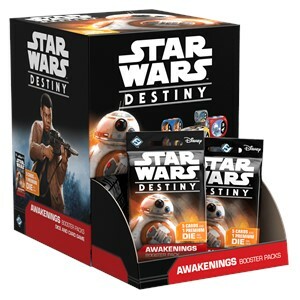 Customize your Star Wars: Destiny decks with Awakenings Booster Packs! With every booster pack you'll find new characters, supports, upgrades, or events, along with new ways to enter the Star Wars galaxy and fight for your chosen side! Offered in 36-count displays, each supplemental booster pack includes five randomized cards and one premium die.